The Trump helicopter is seen at the Mar-a-Lago resort in Palm Beach, Fla., in April. The president's club is requesting foreign worker visas to staff up during peak season. 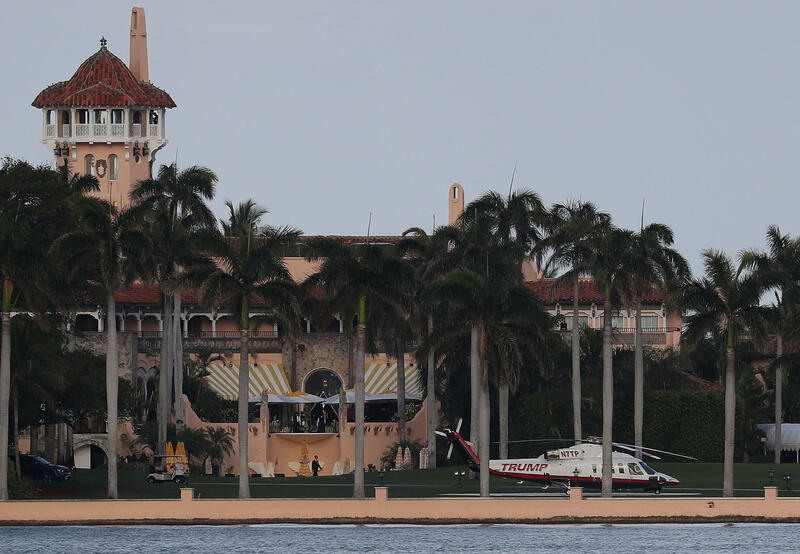 The Trump Organization is asking the federal government for special visas to hire scores of foreign workers for two of President Trump's private clubs in Florida — the Mar-a-Lago resort in Palm Beach and the Trump National Golf Club in Jupiter. The requests for H-2B visas, posted on the Department of Labor website, are for 26 cooks, nearly 50 waiters and waitresses, plus housekeepers, a hostess and a bartender. The jobs range in pay from just under $12 to less than $14 an hour. Mar-a-Lago and the Jupiter club have relied on foreign workers in past years for staffing during their peak seasons, which run October through May. This year, the request for foreign workers comes in the middle of "Made in America" week at the White House. Trump, who has had his own line of ties manufactured overseas, says he wants U.S. companies to focus this week on ways to create more opportunities for American labor. The Trump Organization hasn't responded to questions about the visa requests. In the past, Trump has defended hiring foreign workers at his Florida properties, saying that "getting help in Palm Beach during the season is almost impossible." On Monday, the Department of Homeland Security announced it would be boosting the number of nonagricultural H-2B visas available this year by 15,000.